We sent you another email. Find actively recruiting service year opportunities that match your goals. Connect with people who are serving or are interested in a service year. Learn about the organizations where you can serve. Groups of host organizations working towards a common mission. What is a Service Year? Why Host a Service Year? Why Host with Service Year Alliance? Connect with people who are interested or have already served to learn more. Learn about the many organizations where you can serve. Explore people who want to serve, are serving, or have already completed a service year. Browse groups of host organizations working together toward a common mission. Learn about the many organizations that host service year opportunities. Here’s the URL to the post. Share away! UTEC, founded in 1999 and based in Lowell, was the result of an organizing movement driven by young people to develop their own teen center in response to gang violence. Today, nationally recognized as a model youth development agency, UTEC's mission and promise is to ignite and nurture the ambition of our most disconnected youth to trade violence and poverty for social and economic success. We serve proven-risk youth from both Lowell and Lawrence, MA. UTEC is a family. We assume goodness behind everyone’s actions. We show mad love, unconditionally accepting each person. We offer everyone a clean slate, never giving up. We carry out respectful curiosity, always seeking out moments to connect. We are sponges, actively seeking feedback. We embody contagious passion in all we do. 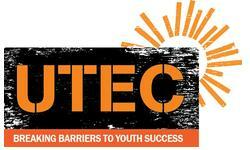 UTEC's nationally recognized model has been carefully designed to achieve our mission. UTEC staff want youth to trade violence and poverty for social and economic success, and we have created a flow of programs that interconnect to achieve just that. The model begins with intensive street outreach and gang peacemaking and then pairs youth with a transitional coach who works with them on a wide set of goals. Youth develop skills in our workforce development program and resume their education through academic classes. Values of social justice and civic engagement are embedded in all programming, with special emphasis on our local and statewide organizing and policy making work. UTEC also provides enrichment activities for youth so that they have a safe place to enjoy themselves and each other's company when not in school or at work. UTEC’s unique model can provide a pathway from the street to the state house for older youth most often overlooked and considered disengaged. Ultimately, the pathway outlined by our theory of change results in three specific outcome areas for our young people: reduced recidivism and criminal activity, increased employability, and increased educational attainment. Learn more about our Impact and see our Outcome report. UTEC's work to document and assess progress toward these outcomes is highlighted in a 2013 case study by Social Solutions, and Social Impact Research identified our social enterprise model as a "high-performing program." UTEC’s model is intentionally long-term and is self-paced; young people move forward as they demonstrate skills and progress as outlined above. Here we provide a summary overview of the model’s key services. Street Outreach, Prison In-Reach, and Gang Peacemaking (Stage 1). Streetworkers build relationships with proven-risk youth, conduct gang peacemaking, visit youth in juvenile detention facilities and prisons to provide supports and build relationships, and recruit target-population youth to engage in UTEC’s programs. Transformational Beginnings (TB) with Transitional Coaching (Stage 2). This transition-focused program serves as an orientation and acclimation period for all new enrollees. Youth work with the TB Coach to prepare for enrollment in TB, particularly focused on all assessment activities (i.e. educational testing and mental health assessment). The TB Coach provides wrap around support during this stage, with much work centered on building relationships with all the adult allies and supports in a young person’s life (i.e. family visits, meetings with their probation officer, information sharing with any clinician or counselor, etc.). Workforce Development and Social Enterprises (WFDSE) with Transitional Coaching (Stage 3). This program center offers youth paid on-the-job experience in our social enterprises: mattress recycling, food services, and woodworking/trades. AmeriCorps members are essential to soft-skills coaching embedded throughout the work experience.The one-on-one relationship with a Transitional Coach helps them to create a service plan and work to overcome any barriers that might prevent a consistent participation (i.e. housing, child care, public benefits, and legal assistance among others). Education (Stage 3). Youth enrolled in the WFDSE Program without a high school credential also enroll in a class to obtain their high school credential (HiSET). Our educational offerings are based on a blended learning program (i.e. recipe writing in the Food Services program is aligned with math competencies being taught in the HiSet preparation class), while also integrating a strong focus centered on social-justice, project-based learning. Civic Engagement (Stages 2-3). We expose youth to the principles of social justice and community organizing. They learn skills to address the problems and inequities in their communities and many youth have the opportunity to become further involved in the experience of being a part of a grassroots organizing or legislative-based campaign on problems identified by youth themselves. Enrichment (Stages 1-3). Afternoon recreational and cultural activities are open to all youth in the local community, ages 15-22, but specifically target high-risk youth who are not yet participating in UTEC’s integrated programming. Follow-Up Services (Stage 4). A Pathways Coordinator checks in with UTEC graduates, as well as each youth’s employer (or higher-education advisor or instructors) over a 2-year period, starting with weekly contact and decreasing over time as a youth demonstrates stability. In fiscal year 2015, our Transitional Coaches served 130 youth as part of UTEC’s integrated programming track. Of these youth, 79% had a criminal history, 47% were pregnant/parenting, 36% were gang-involved, and 79% did not have a high school credential at intake. Of youth engaged last year (FY2015), 85% demonstrated an increase in work performance reviews, and 50% of those without a high school degree obtained their high school equivalency credential. Additionally, 84% who attended workforce programming had no new arrests, and 100% had no new convictions. In addition, of youth who completed UTEC programming 2 years ago, 87% have not been arrested since leaving UTEC, and 83% are currently employed. These outcomes compare favorably to statistics for the state of Massachusetts, where 1% of adults without a high school credential pass the GED test, 1 in 7 young adults (ages 16-24) are unemployed, and 60% of inmates and 74% of youth exiting juvenile justice facilities re-offend within 6 years. UTEC outcomes also represent a cost savings: the Massachusetts Department of Corrections spends approximately $45,500 annually per inmate.